EDIT: This is the first ever appearance of Academic Reading Circles online. Some information, including roles, have been since updated in the book. Click here to see. If you use any information from this post, related ARC posts linked below, slideshares, or the book itself, please attribute it to Tyson Seburn, with a link to the related post, presentation, or book. Thank you! My students very often tend to do the required course readings once, struggling not only with comprehension, but also relating the content from week to week. In order to both improve comprehension and dig deeper, this post is about pushing students to engage with the readings. One lesson I’ve tried to instill in new university students is that to understand material and get the most from a reading, you need to engage with it, like having a conversation where you go down various tangents, inspired by the original discussion, but always being able to bring it back. Likewise, the more you engage with a reading, the less work you’ll need to do later when using it as part of your research. Giving examples or even practicing engagement in a class or two and expecting them to do it on their own simply isn’t enough. Learners need the skills broken down into separate functions to recognise and practice. What do we do to engage with readings? How can they be divided into clearer, concise roles to practice before being put together? And despite strong encouragement, it’s rare that any student will fully grasp how to engage even if they have the gumption to run with it on their own. This has been my experience. Last year, my colleagues and I tried out a version of reading circles in the vein of Furr (2004) with the readings required by the History credit course our students concurrently took. Though it seemed to help them understand the primary and secondary sources, in-class discussion infrequently moved into true discussion. With several factors potentially contributing to this, this year I kept the same general timeline, but determined that I’d control certain factors: 1) modify the roles to suit our students’ needs and our goals, 2) require student reflections after the in-class discussions, and 3) choose the readings myself. Each role needs really to serve two purposes: help engage with material and practice research essay skills. With this in mind, I tweaked Furr’s explanations of the role responsibilities a little. I also added a few roles. Interpreting, evaluating and integrating visual media from readings and into essays is a vital skill at this level. As a result, I added in a Visualiser role, along the lines of the Artistic Adventurer (Daniels 2002) . Another change was emphasise critical thinking regarding bias, reliability and context. In comes my Contextualiser role. Finally, I collapsed the Word Master and Passage Finder into the Highlighter. Otherwise, the Discussion Leader, Summariser, and Connector roles are fairly self-explanatory. I allow students to choose their weekly roles, exceptions: there must be a Discussion Leader and not same role twice in a row. This gives a certain control back. To do this, they update this Google spreadsheet so I can monitor more effectively. a) As the Discussion Leader, [Joe] has led us to understanding this reading and we can get a common view of a whole group. As the Highlighter, [Mark] has shown us the main sentence of the article and explained the complex or topical vocabulary. As the Contextualiser, [Charles] gave us the background of the event. a) …Thirdly, I want to talk about our visualiser, [Smith]. I got really surprised about things she found. Showing the picture about the how Haitian works in the Dominican Republic, map of the Haiti and Dominican Republic, and an introduction video about the film “The Price of Sugar”, really helped me a lot. Because I didn’t find these information when I want to find some information to better understand the article, I got surprised, especially the video. That gave me the visual impact how bad the situation is in Haiti, and helped me remember it better than just reading the words. I collect these ungraded reflections and use them as examples to differentiate fluffy content from substance as well as see what the students themselves feel the value is. It’s great to have choice, especially when reading for pleasure, but when it’s meant to practice certain skills for high-stakes assignments, I’d prefer to take the reins for the time being. Last year, our purpose solely was to have students understand the required readings of the History course. This worked and it didn’t (see above). This year, we decided not to use the required readings themselves, but take another page from the reading circle roles, Connector, by choosing related readings that provide extra context, interesting connections, quotable ideas, and topical discussion. We’ll use increasingly lengthy articles as time goes on and success at how to perform the roles increases. I also plan to choose readings that demonstrate great personal bias, technically challenging vocabulary and increasingly complex, less obvious connections. 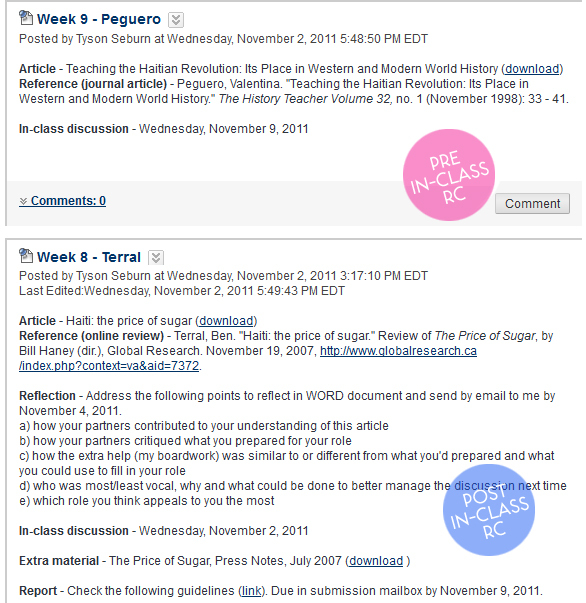 After the in-class reading circle discussion, I post next week’s article on Blackboard as well as extra information (e.g. link to download the article, citation example, date of in-class discussion). To enhance students’ preparation, I often add links to extra material for the current article (see Week 8 example on the right). One final task is to submit a group report one week later. This includes a formatted submission of what they prepared for their roles, as well as modifications based on the group discussion. Little by little, the students seem to be getting more and more from the readings. More and more their desire to investigate more autonomously is improving. And I’m pleasantly surprised by many of their reflections suggesting something to the effect of them being helpful. Furr, M. Literature Circles for the EFL Classroom. 2004. Available at http://www.eflliteraturecircles.com/litcirclesforEFL.pdf (accessed on November 11, 2011). Shelton Strong, S. “Literacture Circles in ELT.” ELT Journal 2011. First published online July 18, 2011 doi:10.1093/elt/ccr049 (accessed on November 6, 2011). ARC in practicum, a concrete example of how this activity worked in reality. The interactions of ARC, which details interactions with instructor and each other. Using this technique of reading circles gives the students meaningful reasons in order to learn. If students are learning English, the circles give them an opportunity to practice their target language besides learning the content. Hi Ellen – You’re right. Giving students a purpose while reading always helps focus them. Students need direction, especially of this age group. This is amazing. I just attended a workshop by Oxford University Press about Reading Circles and learned how this method can be used with secondary students. Thank you for adding to my knowledge about this efficient way of getting the students to develop their reading, discussion and note taking skills. I know that OUP has their Bookworm Club, which involves this idea in a pleasure reading situation. I haven’t actually tried out their version with their suggested books, but I’m sure it’s good. Where was this workshop? The online ones? Our local OUP representative did a workshop and showed the teachers how the reading circles work. I mean, we acted as students and went through the whole process. That was something new for me, and I am waiting for the right moment to do it with my students. Nice! I’ve loved it for a couple years, but keep tweaking things to make it more meaningful for my students. It’s easily adaptable. Thank you for stopping by my blog, Marcia! One thing I’ve often noticed is its use with younger learners, something I’m glad to help modify for higher education contexts as well. There are so many benefits for learners of all ages and contexts to get from performing roles this way, which hopefully they’ll transfer from environment to environment and eventually be able to exercise autonomously. I’m curious though, since you began using them in 1985, where did you get the idea? There are definite conflicts in its origins. I first learned about lit. circles from reading Donald Graves. He is one of the first educators I read in 1983 who started thinking about reading/writing connections in the classroom. I loved his common sense approaches to how students learn to comprehend. He died in 2010, but I continue to use and modify his ideas with my 8th grade English classes. He proposed that student of all ages read aloud in small groups to help each other with voc., expression, and just to make sure they did the reading at all. There was a question or task of the day to focus on and a facilitator to pick up reading materials, etc. I use these roles in lit. 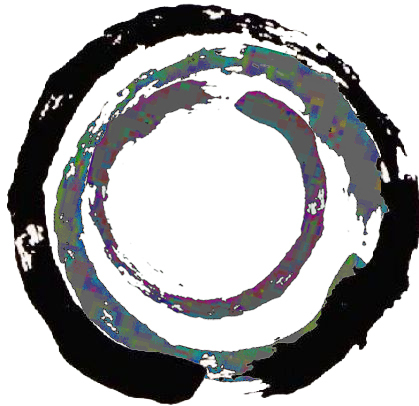 circles: Connector, Literary Luminary, Discussion Director, Summarizer and Illustrator. I have handouts on these roles if you like. email me at marcia.huber@lejardinacademy.org if you want to see any handouts, etc. :) Have a peaceful day! I really like your roles handout Tyson. It is clear, easy for students to understand and gives their reading a very clear purpose, which I think helps to improve engagement with a text. Is it possible to share your handout with other teachers with attribution? Hanks for a great post. Absolutely, Wendy! That’s why they are posted. =) Please pass anything of mine on to anyone who wishes to try it out. Thanks, Sharon. I’m glad to see you using the roles as well. How were your students using them before that was less ‘together’ than now? Next week, the History course is focussing on Susan B. Anthony and the right to vote / rise of feminism, so we thought a good extended reading would be on women in Russian propaganda of the early 20th century. It’s a neat angle, so I’ll be interested to see students make connections. Great post Tyson. I had a great time using Reading Circles with literature, as they were originally intended. To see your adaptation for academic purposes is very interesting and I’m sure I’ll be using your handouts in the future. I mentioned reading circles to your pal Ceci at TESOL France, and I’m sure she’ll be interested in what you’ve written. I’ll be sure to pass it on. I’m glad to hear that you and Ceci have been chatting about me, /cough/, I mean the reading circles. ;) Who are your students, typically? What is their purpose for literature in class? I’ll look forward to hearing how my handouts go with your classes! I used to teach reading and writing to English teachers in Korea, and Monday was our literature day. My biggest ‘hit’ was with ‘Of Mice and Men’ a wonderful book, but not much use in terms of new vocabulary. What the reading circles did was enable them to get involved with the narrative in the way that I wanted them to, as real readers interested in the story, characters, setting, authors intentions etc. To have asked them to go straight into a discussion of the book would have been too demanding. The reading circles enabled them to build their discursive skills so that over a few weeks they became not only able to more confidently and critically discuss the novel, they were able to do it for longer. It reached the stage where I only had to say “it’s reading circles time” and let them get on with it for an hour. It was one of the most successful things I’ve ever done in the classroom, and I’m delighted to see how you’ve adapted it for EAP. Thanks James. I would like to someday use them in their original intended purpose, but for now, I’m satisfied with the EAP adaptation. I lived in Seoul for almost 6 years. Where were you? I also lived in Seoul from 2008 to 2010. I loved it and missed it loads. It’s a fantastic place, and I loved my job. Would go back tomorrow if I could! How interesting! I lived there from 1998 to 2003 and it definitely was an amazing time of growth, for me and for the culture itself. I imagine since then there’s been exponential change as well. There are definitely two groups of people I worked with in terms of attitude towards Korea – love or hate. I swayed between the two. If you loved it so much, what is preventing you from going back? Yes, I know what you mean, I met plenty of people who didn’t like it that much either. I was never quite sure what was keeping them there to be honest! I was lucky in that I was there long enough to enjoy it, but not long enough to become stale. Still, I wasn’t ready to leave when I did. I moved because of my partner’s job, but I can’t complain because that’s what took me there in the first place! You certainly picked an interesting time to be there. Where were you working? The first two years I worked for both a hakwon (BCM Language Institutes) and university (Konkuk) near Kundae Station. The last three I predominantly worked at another hakwon (Pagoda) near Jongro 3-ga station. Turkish Language and literature (to ensure they develop their skill and knowledge of Turkish academically. So in our courses we have literature in all of these areas apart from Turkish (.)))))))). All of the skills are integrated so we don’t have seperate writing, literacy classes. Instead I see my students for 4 hours a day and we cover the whole gambit when it comes to academic English. We as teachers also have task groups where we develop our programme based on various research areas. Mine are the Listening and Reading task group and we have been doing research investigating our department and then faculty and I am also on the English for maths and Science Team amd we run a compulsary part of our Upper course directed at maths and science. There are some definite similarities between your program and mine (though many EAP models share aspects). My students are academically accepted into their undegraduate programs, but not linguistically, so they’ve received conditional acceptence pending their success in our 26-week foundation program, which teaches general academic culture, all skills and strategies for them in academic environments. I focus on reading, writing and vocabulary. The History course they also take is a 1st-year content credit course. As for the Russian women articles, you can take a look if you want. I think they’ll bring about some engaged discussion about content alone, and also with regard to introducing bias and reliability a bit more. I found some scholarly articles as well, but they were far too long for the reading circle purposes, so I’ll likely point to them for extra reading (though it’s doubtful anyone will do that). 1-In your post you said you gave them some extra help. How much and could you give some examples? Hi Sharon! I’m very glad to hear you used the ARC with your students with success. About the help, in class each week, I’ve been putting guiding questions on the board for each role based on the reading (about 3 or 4 each role) just to give students some guidance about functions of the role they may have missed or not focused on. The first week, I tried to put questions that covered the entire article. The second week, I gave questions about only half the article. The third week, I gave two articles and helped them out with only one. My point was to really try to help them figure out what kind of information I’d have thought of had I done the roles myself. I’ve put a few examples of my boardwork for the Week 9 RC in the post above just now. As for essential roles, I ALWAYS have a Discussion Leader, yes. Without one, the group seems a little directionless during the conversation. I encourage always having a Connector because it’s an essential skill almost none have experience with. The others rotate the roles, depending on the number in the group and often one or two roles are absent. True, practice identifies weak spots. I had another group combine with mine a few weeks ago, thinking they’d already done the reading. They hadn’t. So the Summariser’s role suddenly increased in value. I am looking forward to that.) A life of colour. I’m working on the development of an academic reading course for social science students in the Netherlands (social work and pedagogy). One of my immediate concerns was how to get away from the conventional method of presenting and practising time-worn strategies such as skimming and scanning, and getting the learners to become more active. Your ideas seem to offer an excellent solution. The approach is solidly grounded on social constructivism à la Vygotsky (mentioned in your Furr article) and, imho, offers a great way to animate reading classes. I will adapt the roles to reflect better the social science context (more personal experience; less historical context). Looking forward to trying it out next semester! Have you any more feedback to share since your last posts? I’m glad to hear you’re interested in using/adapting the ARC for your context! This year has been all about promoting them and seeing them moved into places I haven’t expected is amazing. There are a few more posts about different points on ARC (see the menu above) and I will be adding more every once in a while between now and when I present them at TESOL France and TESL Canada conferences. I have tweaked the roles and some interaction a little since these posts and will mention that soon. Just busy at the moment. Looking forward to hearing more about how they went for you. Thanks, Leo. It’s really for academic (or at minimum non-fiction) texts that these roles were adapted. Students seem to love them; teachers love their effect on comprehension, confidence and discussion. I’m in my 3rd year of tweaking and using them in classes.